Bible Basics Lesson #7 "Christian Living"
Introduction. When one submits to God's plan of salvation (Lesson Six), one is born anew and is a new creation (John 3: 3-16; 2 Cor. 5: 17). In this new state, "Old things are passed away; behold, all things are become new" (2 Cor. 5: 17). The Christian has a new relationship with his God and his fellow man (Matt. 22: 37, 39). Paul presents the new creature as dead to sin (Rom. 6: 2). He also states, "even so we also should walk in newness of life (vs. 4). The sinner not only participates in his initial salvation, but the saved also is active and obedient. He has crucified the "old man" and has become a "servant of righteousness" (Rom. 6: 6, 18). This new relationship and state began with his primary obedience, which was culminated in his baptism (vs. 4). "Therefore if any man be in Christ, he is a new creature: old things are passed away; behold, all things are become new." "Therefore we are buried with him by baptism into death: that like as Christ was raised up from the dead by the glory of the Father, even so we also should walk in newness of life...Knowing this, that our old man is crucified with him, that the body of sin might be destroyed, that henceforth we should not serve sin." (2 Cor. 5: 17, Rom. 6: 4, 6). Seeking first God's kingdom and his righteousness. An essential and basic pursuit of the Christian is found in Jesus' words, "But seek ye first the kingdom of God, and his righteousness…" (Matt. 6: 33). "First" (protos, see addendum) means just that! We are to first give ourselves to the Lord, cleanse first the inside of the cup (heart), and first cast out the beam out of our own eye (2 Cor. 8: 5; Matt. 23: 26; Matt. 7: 5). The Christian must prioritize his life and God must be first, even over father or mother; son or daughter; and even his own life (Matt. 10: 37, 39). "He that loveth father or mother more than me is not worthy of me: and he that loveth son or daughter more than me is not worthy of me....He that findeth his life shall lose it: and he that loseth his life for my sake shall find it" (Matt. 10: 37, 39). The "kingdom of God" (basileian autou) refers to God's reign. There is no place in God's kingdom or church for the disobedient and self-willed (Luke 9: 23, true discipleship means "continuing in Jesus' word, John 8: 31, 32). The new creature in Christ looks to heaven for his instructions (Phili. 3: 20). The expression "and his righteousness" (kai ten dikaiosunen) means, "whatever has been appointed by God to be acknowledged and obeyed by man…the sum total of the requirements of God" (W.E. Vine, Expository Dictionary of New Testament Words). The local church is commanded to "…withdraw yourselves from every brother that walketh disorderly, and not after the tradition which he received of us" (2 Thes. 3: 6). "For our conversation (citizenship, footnote, dm) is in heaven; from whence also we look for the Saviour, the Lord Jesus Christ" (Phili. 3: 20). The Christian is to be sanctified. Jesus prayed for his followers' sanctification. Hear him, "Sanctify them though thy word: thy word is truth" (John 17: 17). Sanctification (hagiasmos) suggests separation (holiness) to God for spiritual service. The child of God is to be wholly set apart from the world (I Thes. 5: 23). His body and mind are to be "presented a living sacrifice, holy, acceptable unto God…" (Rom. 12: 1, 2). Hence, the Christian is not "a friend of the world" (Jas. 4: 4). He does not love the world and what is in the world, such as: "the lust of the flesh…eyes, and the pride of life" (1 John 2: 15, 16). "I beseech you therefore, brethren, by the mercies of God, that ye present your bodies a living sacrifice, holy, acceptable unto God, which is your reasonable service. And be not conformed to this world: but be ye transformed by the renewing of your mind, that ye may prove what is that good, and acceptable, and perfect, will of God" (Rom. 12: 1, 2). When one becomes a Christian (christianos, an adherent of Christ, belonging to Christ), one is a babe (1 Pet. 2: 2). The "old man" has been crucified and the putting on of the "new man" is a historic fact, but the new man is constantly being renewed in knowledge (on going process, according to the Greek grammar in Col. 3: 10). The babe in Christ is to partake of the milk of the word (1 Pet. 2: 2). However, the babe is commanded to grow (1 Pet. 2: 2, 2 Thes. 1: 3, Eph. 4: 15, 2 Pet. 3: 18). In fact, it is a sin to fail to grow (1 Cor. 3: 1-3). Steady growth must occur in faith, virtue, diligence, knowledge, temperance, patience, godliness, and brotherly kindness (2 Pet. 1: 5-7). If this growth does not take place, we become "barren" and "unfruitful" and we shall fall away (2 Pet. 1: 5-11). "Wherefore laying aside all malice, and all guile, and hypocrisies, and envies, and all evil speakings, as newborn babes, desire the sincere milk of the word, that ye may grow thereby" (1 Pet. 2: 1, 2). The Christian obeys God's commandments out of love. "For this is the love of God, that we keep his commandments," wrote John, "and his commandments are not grievous" (1 John 5: 3). Jesus said, "If ye love me, keep my commandments" and "He that hath my commandments, and keepeth them, he it is that loves me…" (John 14: 15, 21, see the converse, vs. 24). The new man does not forsake the assembling together of the saints in the local church of which he is an active part (Heb. 10: 25 ff, Eph. 4: 15, 16). He has made sure that he has "joined himself" to a scriptural local church (Acts 9: 26, 2 John 9-11). He diligently and enthusiastically assembles on the Lord's Day to remember Jesus in partaking of the Lord's Supper, prayer, preaching, singing praise to God and admonishing others, and giving into the local treasury (Matt. 26: 26-29; Acts 20: 7; 4: 31; Acts 20: 7; Eph. 5: 19; 1 Cor. 16: 1, 2). "Not forsaking the assembling of ourselves together, as the manner of some is; but exhorting one another: and so much the more, as ye see the day approaching For if we sin willfully after that we have received the knowledge of the truth, there remaineth no more sacrifice for sins" (Heb. 10: 25, 26). The Christian is careful not to fellowship or partake of sin. Paul enjoined, "Be not ye therefore partakers with them" (Eph. 5: 7). Not only must he avoid actual participation, but also he must "rather reprove them" (vs. 11). Guarded fellowship is God's way of preserving his truths and people (2 John 9-11). The child of God controls his tongue and uses only pure speech. James taught, "If any man among you seem to be religious, and bridleth not his tongue, but deceiveth his own heart, this man's religion is vain" (Jas. 1: 26). He seeks to have speech "always with grace and seasoned with salt" (Col. 4: 6). His speech is such that "ministers grace unto the hearers" (Eph. 4: 29). He uses his speech to teach others the gospel that he has learned (Phili. 2: 16, Rom. 1: 16). He also uses his tongue to instruct the erring child of God (Jas. 5: 19, 20, Gal. 6: 1). His tongue is expressive of good because his mind dwells on good things (Phili. 4: 8). "Finally, brethren, whatsoever things are true, whatsoever things are honest, whatsoever things are just, whatsoever things are pure, whatsoever things are lovely, whatsoever things are of good report; if there be any virtue, and if there be any praise, think on these things" (Phili. 4: 8). The new creature's general demeanor is reflective of one who has been with Christ (Acts 4: 13). He (she) does not dress immodestly, laugh at or tell obscene jokes, watch filthy movies, fornicate, or disobey civil law (1 Tim. 2: 9; Eph. 5: 4; 1 Cor. 6: 18; Rom. 13: 1-7). Such a life of uprightness is not a result of mechanical, legalistic service, but springs out of "putting on the new man, which after God is created in righteousness and true holiness" (Eph. 4: 25). God will not arbitrarily leave his children (Heb. 13: 5). The biblical rule is: "…The Lord is with you, while ye be with him; and if ye seek him, he will be found of you; but if ye forsake him, he will forsake you" (2 Chroni. 15: 2). God is able to keep the Christian from falling, but we must keep ourselves in God's love (Jude 21, 24). The means of preventing falling from God's grace (Gal. 5: 4) is growth and knowledge (2 Pet. 3: 17-18). "Ye therefore, beloved, seeing ye know these things before, beware lest ye also, being led away with the error of the wicked, fall from your own steadfastness. But grow in grace, and in the knowledge of our Lord and Saviour Jesus Christ. To him be glory both now and for ever. Amen" (2 Pet. 3: 18-19). Conclusion. In closing, the message of victory is the Christian is not alone in his efforts; God is with him. After commanding Christians to "work out their own salvation with fear and trembling," Paul states "For it is God which worketh in you both to will and to do of his good pleasure" (Phili. 2: 12, 13). "Nay, in all these things we are more than conquerors through him that loved us," says the language of triumph (Rom. 8: 37ff). Any and all sacrifice and struggle shall be worth it when the "crown of glory that fadeth not away" is received (1 Pet. 5: 4, 2 Tim. 2: 12, 1 Pet. 4: 12-16, Jas. 1: 12). Addendum: Protos, [Adjective, 4413] the superlative degree of pro, "before," is used (I) "of time or place," (a) as a noun, e.g., Luke 14:18; Rev. 1:17; opposite to "the last," in the neuter plural, Matt. 12:45; Luke 11:26; 2 Pet. 2:20; in the neuter singular, opposite to "the second," Heb. 10:9; in 1 Cor. 15:3, en protois, lit., "in the first (things, or matters)" denotes "first of all…" (W.E. Vine, Expository Dictionary of New Testament Words). "A" for "Attendance" and "Apostasy"
"D" for "Dress", "Drinking", and "Drug Abuse"
"F" for "Fellowship" and "Fornication"
Q1. According to 2 Cor. 5: 17, "Therefore if any be __________ , he is a __________ : old things are __________ ; behold, all things are __________ ". Q2. Do the saved also participate in their salvation? Q3. According to Rom. 6: 6, "Knowing this, that our __________ is crucified with him...". Q4. What are the saved to seek first? Q5. The Christian must put God first even over whom? Q6. What type people have "no place" in God's Kingdom? Q7. What is the church commanded to do regarding those who walk disorderly? Q9. How much of the Christian is to be sanctified? Q10. According to 1 Pet. 2: 1, 2, "As __________ , desire the sincere milk of the word, that ye may __________ ". Q11. What prompts the Christian to obey God's commandments? Q12. 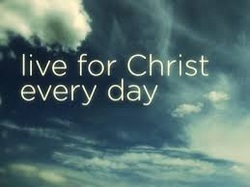 According to 1 John 5: 3, "For this is __________ , that we keep his ___________ ...". Q13. What does the Christian not forsake? Q14. In addition to not fellowshipping evil, what is the Christian to do? Q15. Must the Christian control his tongue? Q16. How does the born again dress? Q17. What kind of movies does the Christian not watch? Q18. What must the new creature do regarding God's love? Q19. Is the saved strictly on their own in their efforts to live right? Q20. According to Rom. 8: 37, "Nay, in all these things we are more than __________ ...".